The eagerly awaited new Peugeot 3008 SUV is now on sale at Hugo Loonam Motors. The all-new Peugeot 3008 SUV is a sophisticated and stylish vehicle that combines efficiency and high levels of safety and technological equipment. The range starts from €25,995 plus delivery-related charges for the entry level model - the Access 1.2 130bhp PureTech petrol version. With a choice of five trim levels, including Access, Active, Allure, GT Line, and GT versions, a wide range of both petrol and diesel engines are available. The 1.2-litre PureTech 130bhp turbo petrol engine was voted International Engine of the Year in its category earlier in 2016. This engine is available with a six-speed manual gearbox or with Peugeot’s latest generation EAT6 six-speed automatic transmission. The 1.6 THP petrol 165bhp BVA automatic has emissions from 129g/km CO2. Four BlueHDi diesel engines are available, trim-dependent, with CO2 emissions from 103g/km and power ranging between 100, 120, 150, and 180bhp. The 2.0 litre BlueHDi 150bhp version is matched to a six-speed manual gearbox, while the 1.6 BlueHDi 120bhp version is available with a choice of a six-speed manual or a six-speed EAT6 automatic gearbox. The GT version comes equipped as standard with a refined 2.0 litre BlueHDi diesel 180bhp six-speed automatic. Standard features on level one Access models include Peugeot iCockpit interior comprising a compact steering wheel, a configurable 12.3" head-up digital instrument panel, an 8” capacitive touchscreen, multifunction steering wheel, Bluetooth, and USB connectivity. 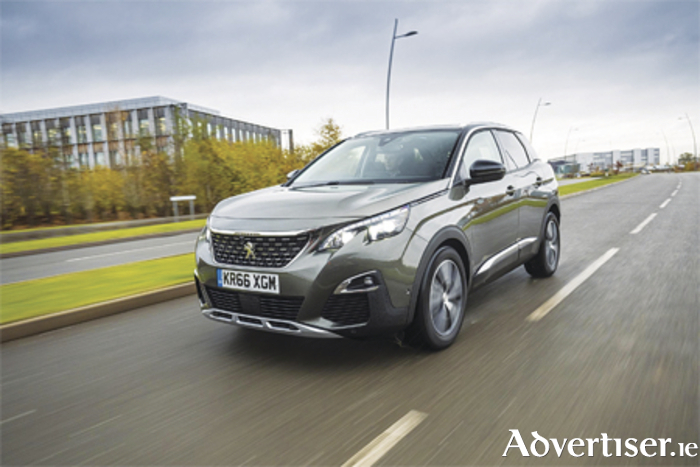 The new 3008 SUV range includes a host of safety equipment ordinarily only available on top-of-the-range models, from level one. The level two Active model, with an RRSP from €28,295 plus delivery, gains the Euro NCAP Pack, rear parking sensors with 180 degree reversing camera, 17” alloy wheels, alloy roof rails, electric parking brake with hill assist, automatic headlamps and wipers, rear parking aid, LED daytime running lights, front fog lights with chrome trim, and much more. Allure versions, with an RRSP from €29,855 plus delivery, see the addition of a Safety Plus Pack to include active blind spot detection (ABSD ), active lane keeping assistance (LKA ), and advanced driver attention alert (DAA3 ). Also added is Peugeot Smartbeam Assistance, door mirror mounted LED courtesy approach lights, front parking aid, black front wing trim with chrome detail, stainless steel door sill scuff plates, and 18" diamond-cut alloy wheels. The GT Line level four model, with an RRSP from €33,225 plus delivery, boasts as standard over the Allure model, self-levelling full LED headlamps, LED fog lamps with cornering function, LED sequential scrolling front indicators, 3D connected navigation, TomTom Live updates, voice recognition, and much more. The GT 2.0 litre BlueHDi automatic version will be available later. Also in stock at Hugo Loonam's is the new Peugeot 2008 SUV. Call Hugo Loonam Motors on (090 ) 6457104 for more information or visit the showroom in Cloghan.